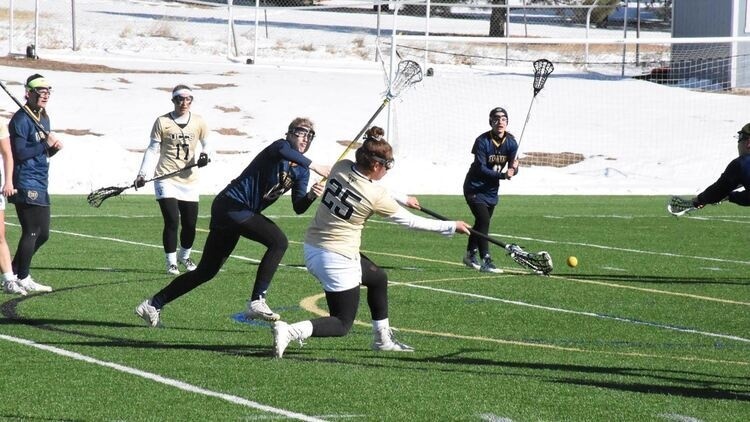 The University of Colorado Colorado Springs women's lacrosse team is traveling to Shawnee, Oklahoma to take on Oklahoma Baptist University on Saturday Mar. 9 at 11 a.m. The Mountain Lions will then have a quick turnaround as they are set to host Illinois Wesleyan University on Monday, Mar. 11 at 5 p.m. at Mountain Lion Stadium. After playing three straight nationally ranked opponents, UCCS has a record of 1-3 on the season so far. The Mountain Lions have scored 50 goals on 117 shots while also racking 22 assists, giving them a shooting percentage of 43 percent and 72 total points. They also have 61 draw controls compared to their opponents 49 and have caused 47 turnovers. Individually, Angela Naughton, Vanessa Nelson and Brianna Martinez lead the team offensively as each of them have 10, eight and six goals on the season so far. Naughton is leading the team in point as well with 15, as she has five assists to go along with her 10 goals. Martinez has nine points on the year thanks to her three assists, and Natalie Church also has nine points due in large part to her team leading seven assists. Church leads the team in draw controls as well with 19. Ellie O'Brien leads the team in caused turnovers with nine, and goalkeeper Kennedy Travis leads the team in saves with 21. UCCS hosted two nationally ranked opponents last week in Colorado College (#21 in IWLCA Division III) and University of Tampa (#11 in IWLCA Division II). Against Colorado College (CCU), UCCS scored 13 goals on 28 shots, including seven in the first half. However, it was not enough to take down CCU as they scored on 18 of their 38 shots, 11 coming in the first half. Eight different players scored in the game against CCU, including five different players scoring two goals. Angela Naughton had a team high five points in the game, tallying two goals and three assists. Sydney Malcolm, Madison Ellis, Vanessa Nelson and Mallory Corrigan all had two goals as well. Natalie Church led both teams in draw controls with seven and had two assists and one goal, giving her three points on the afternoon. The game against Tampa was less competitive as the Spartans outscored UCCS 12-2 in the first half, and 16-4 overall. The Mountain Lions struggled against Tampa's defense as they were only able to attempt six shots (four on goal) in the first half and seven in the second, compared to Tampa's 24 first half shot attempts and 16 second half shot attempts. Angela Naughton was a bright spot for the Mountain Lions in this game as she was able to record a hat trick on the day. Naughton scored on three of her five shots and added an assist to give her four points on the day. Madison Ellis was on the receiving end of the assist from Naughton for the only other goal for UCCS on the day. Goalkeepers Emma Becker and Kennedy Travis were berated with shots in this game but were able to record eight saves as a pair, with Travis getting seven of the eight saves. Oklahoma Baptist has a 2-1 record this year. As a team, the Bison have scored 48 goals on 98 attempts this year, giving them a shooting percentage of 49 percent and an average of 16 goals per game. They also have nine assists, seven free position goals, 52 draw controls and have caused 39 turnovers on the season. Lauren McCormack, Taylor Skomp and Devin Miller are leading the team in most statistical categories, with each of them totaling 17, nine and 10 points on the season respectively. McCormack leads the team in goals scored (14) and assists (three), and has a staggering 40 draw controls on the season, which also leads the team. Skomp and Miller each have nine and seven goals respectively, with Miller adding three assists. Skomp also leads the team in caused turnovers with six. Courtney Barnickle is the main goalkeeper for the Bison, as she has recorded 26 saves and has a 2-1 record so far this season. So far this season, Illinois Wesleyan has a record of 3-0. As a team, the Titans have scored 49 goals on 87 shots, giving them an overall shooting percentage of 56 percent and a shots on goal percentage of 84 percent. They average just over 16 goals and 29 shots per game while holding their opponents to 10 goals per game. Statistically, the Titans also have 11 free position goals, 21 assists, 53 draw controls and have caused 26 turnovers this season. Their goalkeepers have collectively tallied 25 saves as well. Grainne Kelly, Riley Rooney and Landry Elliot lead the team offensively with 15, 11, and 10 points respectively on the season. Kelly leads the team in goals with nine and assists with six on the season. Rooney and Elliot have eight and seven goals and three assists respectively this year. Dani Engelbreit leads the team in free position goals with 3 and draw controls with 23. Goalkeeper Janaye Godfrey leads the team in saves as she has 24 of the 25 on the season in two appearances. The forecast for Shawnee, Oklahoma shows a high of 64 degrees this Saturday with some thunderstorms expected early in the day. Wind is expected to gust up to 22 miles per hour on Saturday as well, but conditions should be clear for the game. The forecast for Colorado Springs on Monday, Mar. 11 shows partly cloudy skies with a high temperature of 49 degrees. Winds are not expected to gust any higher than nine miles per hour. For any updates on schedule changes due to weather, visit gomountainlions.com. The Mountain Lions will play host to RMAC opponent Colorado State University-Pueblo on Thursday, Mar. 14 at Mountain Lion Stadium. The game is scheduled to start at 5 p.m.